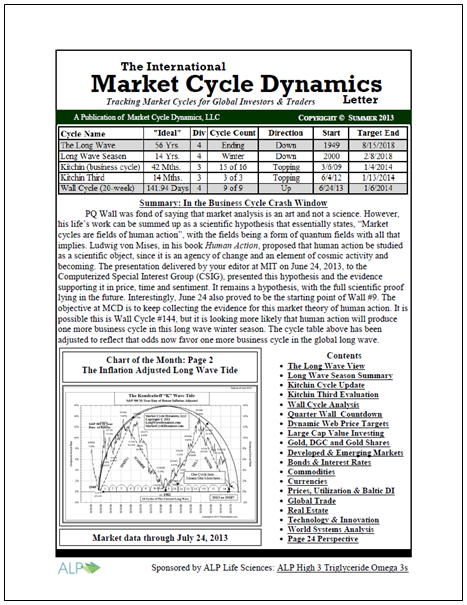 Market Cycle Dynamics (MCD) was created to research and track global market cycles in price, time and sentiment, and publish The International Market Cycle Dynamics Letter and the MCD Weekly Briefing blog. The Market Cycle Dynamics (MCD) approach and method of market cycle analysis provides a “formula timing plan” by identifying large and small market cycle tops and bottoms. The goal is to provide market cycle turning point analysis for individual and professional investors and traders who make their own informed investment decisions. David Knox Barker is the founder of Market Cycle Dynamics, LLC, and the publisher and editor of The International Market Cycle Dynamics Letter. Barker is one of the world’s foremost experts on market cycles, the economic long wave of innovation, and Fibonacci based market analysis. He is the creator of the Market Cycle Dynamics (MCD) software and author of The K Wave. He is a writer, entrepreneur and technical market analyst. He has researched stock market cycles and written on the impact of the long wave on international financial markets and the international political economy for over 25 years. Barker developed the powerful Market Cycle Dynamics Formula Timing Plan approach to market cycle analysis based on decades of market cycle research in price, time and sentiment. Barker discovered the Fibonacci grid drill-down method that works in any market to uncover multiple levels of nested Fibonacci grids within grids for identification of cycle pivot points in long and short cycles. Barker was founder and CEO for ten years from 1997 to 2007 of a successful life sciences research and marketing services company, serving a majority of the top 20 global life science companies. Barker is also founder of ALP Life Sciences, LLC, a lipid metabolism research company, which is managing research and development on the Nanoveson(TM) project, targeting the global epidemic of fatty liver disease in the form of NAFLD and NASH. ALP is also the manufacturer and distributor of ALP High 3, the most potent, pure and bioavailable formulation of Omega 3 fish oil available, with 10X and greater absorption over typical products. Barker received his bachelor’s degree with a major in finance and a master’s degree in political science. His master’s thesis research explored disequilibrium in the international political economy from the long wave perspective. He is happily married to Berdjette, a citizen of Switzerland, and they are the parents of three great kids. His hobbies, in addition to market cycle analysis, include reading, writing, running and discussing big ideas with family and friends. MCD is a market cycle dynamics analysis service and does not provide investment advice. MCD is not a registered investment advisor with the SEC. Investing and trading involves risk that should be explained to you by your investment advisor.